It’s not a groundbreaking premise: hard-nose coach with a heart of gold leads rag tag crew of athletes to victory. But MCFARLAND USA is not stale either. It is not common, for instance, to see a feature focused on Latin American culture with a mostly Latino cast. And I can’t remember the last time I saw a movie about cross country running. Most interesting is the true story at the root of this movie, about a teacher named Jim White (played by Kevin Costner). While teaching P.E. 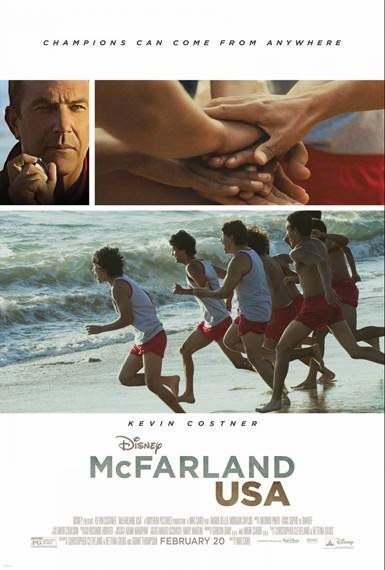 in McFarland, a poor town in California, White spotted natural abilities in his students. Children of immigrants, and field workers, the students worked the fields in the morning, went to school during the day and would still be running a near-5-minute mile before sundown. In 1980, White started a cross country team, unheard of in the area, and taught them to harness their toughness and strength. He gave them hope and confidence where there was none before. The McFarland High School running program went on to win 9 State Championship titles in 14 years under Coach White. Costner seems perfect for the Coach White role. It’s not a stretch by any means, but the man sure can give a motivational speech. The character is balancing commitment to the team, spending time with his family, and trying his best to assimilate into a mostly-foreign culture. There are silly moments (think Costner on a pink bike with handlebar streamers). And there are sad moments. His wife, played by Maria Bello (A HISTORY OF VIOLENCE, PRISONERS), is a supportive and pleasant character – even if her character does come across as a bit weak. His team of runners makes up the collective supporting role. Led by their fastest and most focused runner, Thomas Valles (played by Carlos Pratts, PARANORMAL ACTIVITY), the team of underdogs earns audience support. Their lives are difficult, and their running shoes are held together with tape, but their spirits are high. They are charming and funny. Their hard-working families struggle to get by, but they are proud of their sons. They are easy to love. I am not exaggerating when I say that the audience I watched this movie with erupted with applause – twice – while watching the team’s chubbiest runner Danny Diaz (Ramiro Rodriguez) in action. If there were another supporting role, it would be the McFarland community. The movie really highlights the community’s pride in their families and their Latin American culture. Throughout the story we go into family homes for home-cooked meals and hospitality. The tight-knit community supports the team with a fundraiser and even throws a quinceañera – a traditional celebration in Latin American culture for a girl’s 15th birthday – for White’s teenage daughter. The musical score by Antonio Pinto (LORD OF WAR, LOVE IN THE TIME OF CHOLERA) completes this package. There are some eye-roll inducing moments as one might expect from such a heart-warming family feature. The dialogue, for example, leans towards over-dramatic. And there is actually a montage of all the characters singing the National Anthem in unison. But it’s all in the name of family fun.